Nor Door Sport & Cyclery in Door County is a complete bike rental, repair and retail shop that is open year round. The main shop is conveniently located in Fish Creek, on Highway 42, not far from the entrance to Peninsula State Park (and now a new shop in Sturgeon Bay!). Open since 1983, their impressive, 7,100 square foot shop opened in the Spring of 2007. This family run business has over 34 years of experience in the biking business, so they will be sure to meet and exceed your needs! And in 2013, they celebrated their 30th anniversary in business - and we know why. They are excellent at what they do and know that customers come first! Highly recommended! While retouring Nor Door Sport & Cyclery, we interviewed a woman just returning from a Peninsula State Park biking trip, with a bike and child carrier from Nor Door. Here is what she said, below. There is nothing else like biking through the Door County Peninsula! 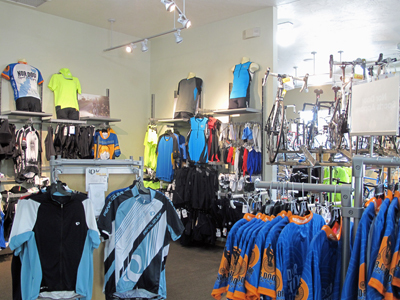 Nor Door sells the best lines in bikes, accessories; even outdoor apparel for both men and women from companies like Pearl Izumi, Nike and Trek. New lines in in 2017 include Patagonia and Marmot - so you will find some great lines here at Nor Door - complete shop and rentals! You can find all types of bikes for rent and for sale at Nor Door; from comfort and hybrid bikes) for road and path riding), mountain bikes (with front or full suspension), road, tandem, kids, recumbents, even trailers and tag-a-longs units. Child carriers are available. And you’ll find fine lines like Trek™ , LeMond™, Fisher™, Waterford™ and Gunnar™. In general, rentals are available by the hour, day or multi-day. And they have electric motor assist bikes to rent (e-bikes) that assist you pedaling and can go up top 28 miles on a charge! Rentals for $15 1 hour, $25 2 hours or $50 a day. These are very cool - and are hot! Only place in Door County that we know of that has them!! 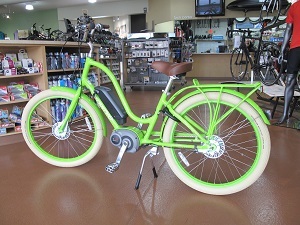 You can buy them new or rent them in Fish Creek, or buy them new at Sturgeon Bay shop (no rentals of the electric motor assist bikes in Sturgeon Bay). We rode these bikes in Peninsula State Park, and they are cool. They have three assist levels (they do not power the bike without pedaling) - and each level assists you more in making it easier to pedal. These are great bikes! The shop is full of accessories like cycling lights, mirrors, peddles, grips, water bottles, racks, tools of all kinds, locks, helmets, shoes and clothing. Accessory lines include Camelback™, Trek™, Shimano™, Yakima™, Saris™, Serfas™, and Park™ tools, and Hollywood™ racks. If you are bringing your own bike to Door County, then you can rest assured that Nor Door is here to help in case your bike needs repair. This is a full service repair shop, and offers very quick turnarounds on repairs on your own bike, during your stay in Door County. Often same day or next day repairs can be made to get you back on the biking trails fast. Nor Door offers a special “Rent-A-Demo” program, which allows you to rent a higher end road bike by the day only. 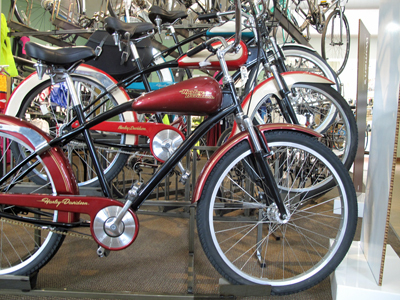 You can even bring your own peddles and shoes and they will equip a road bike for your use. In winter, Nor Door rents snowshoes, cross-country skis, and tubes – so they will take care of you all year long. Awesome place! And Brian told us that they get new bikes every year for the rentals. That's right. So you are renting and riding a pretty new bike every year. They sell off all the rental bikes starting in October/November timeframe each year. Nor Door can even build custom bikes from scratch, or restore long neglected bikes as well. When they say “full” service, they mean it! You will find that they will do everything to make sure you are happy, whether you are renting, purchasing or getting your own bike repaired. Nor Door even published a “Nor Door Sport & Cyclery Trails” newspaper that is chock full of useful information and tips, and bike trail maps. Ask their knowledgeable staff about the best tours you can take, where to find beautiful trails and how to get the most enjoyment out of your Door County trip. We have biked through Peninsula State Park, and it was wonderful, so make sure to take a tour there too. So whether you bring your own bike, need to rent one, or get one repaired, Nor Door Sport & Cyclery is standing by ready to make your trip the best it can be! Stop in and see this magnificent shop, and see what we mean. And when you give them a call, please tell Brian and the staff that DoorCountyNavigator.com sent you!